Heroes of Might and Magic V is a turn-based strategy video game fully rendered in 3D and the game art features classic fantasy creatures in an epic world setting. The story arc is covered in the original Heroes of Might and Magic V game and two expansions, Hammers of Fate and Tribes of the East. A significant sidestory is explored in greater detail in the first-person fantasy role-playing video game Dark Messiah of Might and Magic. 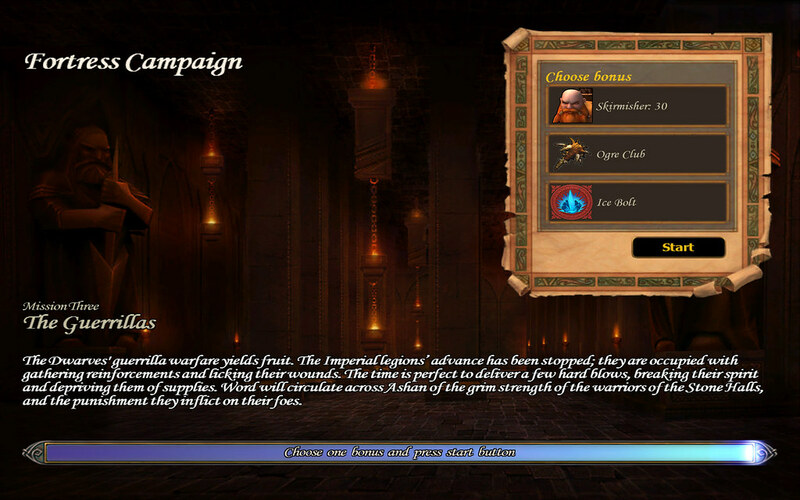 This page has fantasy art, game scenes, cutscenes, and gameplay movies from Heroes of Might and Magic V: Hammers of Fate - campaign 1 "Wulfstan's Defiance" mission 3. There is no cutscene at the start of this mission. The main tasks are to free a hero, help him escape by clearing the way, take back a Dwarf citadel, and intercept a payroll caravan. The latter is referenced in the cutscene that begins mission 4, The Brothers.